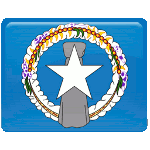 The Commonwealth of the Northern Mariana Islands is one of the inhabited US territories and one of the two territories with Commonwealth status, along with Puerto Rico. The archipelago was originally colonized by the Spanish. In 1899, it became part of the German Empire. Following WWI, the islands were awarded to Japan. The United States invaded the islands in 1944. After WWII, the archipelago was officially administered to the United States. After Guam rejected integration with the Northern Mariana Islands, the people of the archipelago decided to forge closer connection with the US rather than seek independence. In 1975, a referendum on becoming a US commonwealth was held in the Northern Mariana Islands. 79% of voters approved the covenant to establish a commonwealth in political union with the US. The covenant was approved by the US Congress on March 24, 1976. The anniversary of this event was proclaimed a public holiday.